In this episode, we interviewed Kade Morton, the founder of Aletheia, to learn more about the project. Aletheia is a decentralised open access publishing platform for scientific research, the project aims at fixing several issues with the current publishing system in research by introducing a new technology, decentralization through a blockchain network, to the publishing field. After introducing himself, Kade explained what blockchain and decentralization are and how Aletheia platform aims to implement these technologies in their open source publishing platform. Kade also explained how he came to work on such a project: after watching the famous documentary about Aaron Swartz online, Kade felt inspired to start developing the Aletheia project. So far, there are three people working on Aletheia as the core team: Kade Morton (co-founder), Roo (developer/co-founder), Lisa Matthias (social media manager). It is an open source project and the team is currently looking for volunteers in different fields such as developers, web designers, etc. If you'd like to contribute, please find their contact information are below. In this episode we interviewed Dr. Rachel Harding, a postdoctoral fellow at the Structural Genomics Consortium, University of Toronto. Rachel’s current work is focused on the structure of huntingtin, a mutated protein in individuals suffering from Huntington’s disease. During the episode we talked about Huntington’s disease, sharing your results on a regular basis on a blog, setting up a blog and the intellectual property issues related to sharing your data in such a way. An interesting point in this area of research is that not all results are published: positive results only are actually published and reaching a positive result requires a lot of trials and errors. However those trials and errors are often neglected. Rachel created a blog, called LabScribbles, where she records everything she does in the lab, all her positive results but also trials and errors. Rachel explains this workflow, how it helps her improve her method in the lab, how it helps other researchers, how it helps her exchange with them, and even create a community around her work. We also explored the intellectual property issues related to the Labscribbles a blog. In Rachel’s case, her funding comes from the Cure for Huntington’s Disease Initiative Foundation, a non-profit biomedical organisation. Depending on your employer and organization, it might be forbidden to share your research in such a way, but Rachel was able to explain, in her opinion, how such intellectual property are not a real issue (in most cases). In this episode we interviewed Monica Granados, a postdoctoral fellow at the University of Guelph & Wildlife Conservation Society Canada. Monica explained how she was introduced to open science and how practicing in the open helped her advance her projects. She is developing a mobile app with Jacob Ritchie, a computer science graduate student at the University of Toronto to make fish consumption advisory data more accessible to the public including the indigenous communities of the northern parts of Ontario. If you’d like to to know more about the project or would like to contribute to the app development, click here. Monica also discussed her recent open access article, Stabilizing mechanisms in a food web with an introduced omnivore. She explains how important it is to share raw data for reproducibility and how working in the open changed the way she prepared, delivered and published her manuscripts. Working in the open has improved the way Monica does research and now gives workshops to other researchers on how to practice in the open. Monica also shares these and other tutorials through her github repository which can be accessed here. Monica explains how improv' can help a researcher become a better science communicator. In this episode, we interviewed Bastian Greshake, PhD student in Applied Bioinformatics at the University of Frankfurt am Main, in Germany. If you are a researcher in a field somehow related to genetics, you might have already used OpenSNP to explore SNPs (Single Nucleotide Polymorphisms) in an open dataset. In that case, you probably already know Bastian and his work. Bastian started working on OpenSNP, a platform which allows users to upload their genotyping data and make it available to the community. 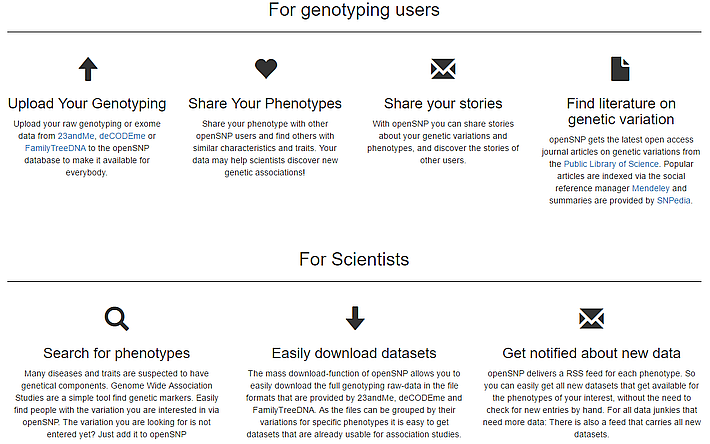 The platform also allows users to share their phenotypes in order to help scientists discover new genetic associations. It also automatically gets the latest open access articles about genetic variations to inform users and researchers about SNPs. Bastian explained how to start an open source project, the issues related to these kind of projects. We also explored how to get more users for an open source project without any advertising budget, and how to get more contributors to help you develop a similar project. In the second part, Bastian helped us understand the issues related with sharing open data results with the community and how himself and his team are protecting themselves against any legal risks by ensuring that users clearly know what they are putting themselves into when using the platform. A very clear paper explaining most of the elements we discussed during this podcast episode was written by Bastian and his co-authors, the paper was published (obviously open access) in the journal PLOS ONE and is a highly recommended read by the ColperScience team for anyone interested by working around open source or open data in research. The survey amongst the openSNP users that is referred to during the episode can also be found there. If you have any questions or remarks, please post a comment at the bottom of this page, or contact us directly through Twitter. Thanks for listening ! Bastian talks about gamification and how it could help certain projects involving massive data.